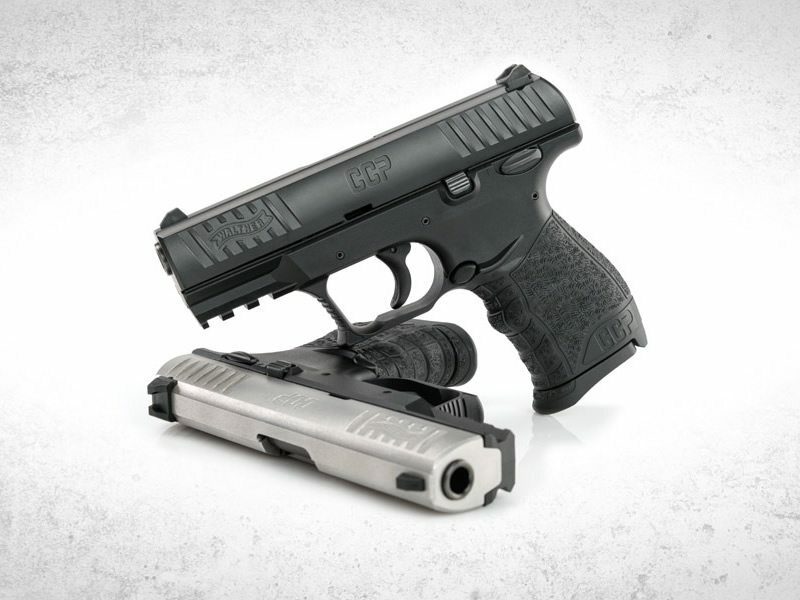 Shooting Review – The Walther CCP | Eagle Gun Range Inc. The Walther CCP—Concealed Carry Pistol—is a conundrum. It has some highly valuable and interesting features and some highly frustrating ones as well. It’s a wonderful shooter, so long as you don’t intend to shoot much with it (I’ll explain later). It’s exceedingly simple construction somehow results in an exceedingly difficult disassembly process. It is made specifically for concealed carry and yet it’s almost too big to easily conceal. This is a strangely contradictory firearm and it deserves a closer look. I recently had the chance to spend some time with the Walther CCP on the range, putting a couple hundred rounds through it, and I both liked and disliked what I found. I wonder what you’ll think of it. Why Consider the Walther CCP? The qualities that should make you take notice of the CCP include its highly ergonomic grip design and the fact that it is a single stack, making it a bit more concealable than a similarly sized double stack model. The 8+1 capacity is one better than most of its competitors, but seems light with such a tall grip. The CCP has a couple of interesting features, not the least of which is the fact that it has a fixed barrel and no slide rails! The barrel is fixed to the frame and does not move while firing. The slide moves back and forward over the barrel and the rear catch while a gas piston mechanism regulates the articulation. Interesting stuff! As a purpose-built concealed-carry pistol, however, it’s sort of an odd bird. It is slightly taller than a Glock 19 and almost as heavy. It’s wider than many single stack compacts and the grip offers a full hand’s accommodation. 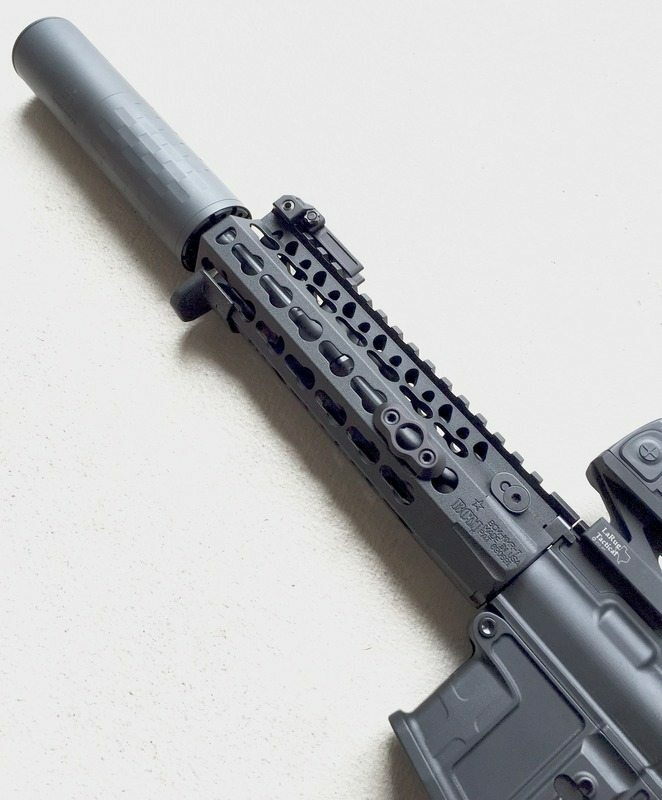 So even though it’s made specifically for concealment, it is certainly not for deep concealment, as some single stacks are. Capacity aside, you’d expect some mitigating features as compensation. As we’ll see here, you’d be right (yet with one big downside)! But first, let’s look at the specifications. The Walther CCP is one of the more comfortable pistols I’ve ever held. The grip fit my hand like it was made for it. It was a joy to bring up on target. The first thing I notice after only ten shots or so was just how accurate this pistol is. All told, my groups were consistently smaller with the CCP than I’ve shot with any other pistol, at every distance from 3 to 15 yards. The barrel is shorter than that of a Glock 19, but despite the fact that I shoot my G19 several days/week, I was consistently more accurate with the Walther CCP. The trigger is not great. The takeup is a bit long, almost like a single-action trigger. In the press you can feel a stuttering that feels like plastic rubbing on plastic. This is exacerbated by the length of the takeup. I also didn’t enjoy the loooonnng reset, which must go all the way out to its original position for the reset to engage. I found the sights very easy to pick up, but the 3-dot sights on my CCP were bright white while I’ve seen pictures of other CCPs that had dull, gray dots. Dunno if this is a deliberate change on the part of Walther or just bad photos of those other pistols. The big ding against the Walther CCP, in my opinion, is the fact that after 25 or so rounds, the front end of the frame is uncomfortably hot to the touch. After 75 rounds, I had to put on a glove, as I could not properly grip the pistol. This frame heating is an unfortunate result of the gas piston system. With each round’s gasses escaping into the piston chamber via a small hole in the bottom of the barrel, the heat builds up and pretty soon the gun is too hot for your support hand. I have to wonder if anyone at Walther shot more than 10 or 15 rounds through their gun during its development and testing! This is a single-stack pistol so the grip should not be so comfortable. And yet, it’s among the more comfortable guns I’ve ever put into my hands. Walther did quite a good job creating the grip on this one, and that includes the grip texture. I have to note that after a few dozen shots, comfort wanes as the frame heats up. Despite Walther’s claims of “softcoil technology,” I found the recoil to be pretty sharp. I tend to bear down hard with my grip and I had trouble keeping my support hand in place on fast shooting strings of 3 or more shots. The recoil wasn’t unmanageable, but it was more than I expected with such a large compact gun. This is a shooting review, so I will not comment definitively on the CCP’s concealability. I will simply note that the single-stack aspect of the grip will aid in concealability while the overall height of the CCP’s grip will work against it. This is not a subcompact and, as noted before, the grip is a bit taller than even a Glock 19. The Walther CCP will likely not be the most concealable single stack you can find. Despite the grip’s height, the 8+1 capacity is not bad for a single stack concealed-carry pistol, but perhaps low for one of this size. The CCP looks like a well-contoured version of most polymer-framed pistols, but the similarities end there. This is quite a unique machine. Due to the fixed barrel and gas piston system, the recoil spring on the CCP is not nearly as heavy as those on other pistols. This feature makes it very easy to rack the slide; a good fit for some women and the elderly, whose hands may not be strong enough to rack the slide on most pistols. Field stripping the Walther CCP is, well, pretty ridiculous. This is a shooting review, so I did not have the opportunity to perform a field strip, but if you’re considering the CCP I encourage you to watch one of the many videos that demonstrate the take down. It requires a special tool (that comes with) and seems to very nearly require 3 hands to accomplish! Unlike many modern pistols, the CCP has a thumb safety. The safety control lever is quite small as compared to most others and feels almost dainty. As safety controls go, this one seems well located and despite its small size it is not difficult to manipulate. 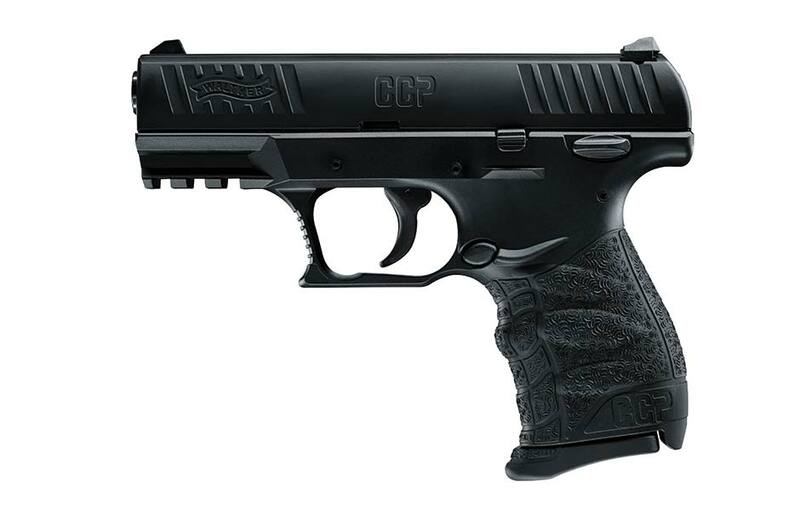 The Walther CCP is one of the most comfortable-to-hold pistols I’ve touched. The grip contours and quite nice and the texture makes this one of the only pistols you’ll find that doesn’t require skate tape or stippling. The fixed barrel and piston system make the CCP interesting and unique. Perhaps most importantly, I find this pistol to be incredibly easy to shoot accurately. The CCP is quite heavy and large for a single stack, 8+1-capacity compact pistol. The felt recoil is significant. The trigger, at least out of the box, has an odd takeup texture and a long reset. Field stripping the CCP is strange and difficult. Perhaps the biggest knock against it is the fact that after 70+ rounds, the gas piston system heats the upper frame to 150-200F degrees (as proven in at least one review video), rendering it impossible to grip properly. I have to wonder if repeated heating will weaken the frame materials. The grip is sooo very comfortable and the controls are in the right place for my medium-sized hands. With such a comfortable and accurate pistol, the only knocks against the CCP I could suggest are the sharp felt recoil and the inability for one to properly place the support hand on the frame after 50 or so shots (owing to heat buildup). These issues aside, it’s an eminently shootable pistol. So very accurate for a short-barreled pistol! Can’t score this one, as I only put a couple hundred rounds though the CCP. In that short time, though, I experienced no malfunctions or hiccups. I have to admit I’m greatly torn considering the Walther CCP. The ergonomics, excellent grip texture, fixed barrel design, and easy accuracy make me WANT. The strange trigger and frame-heating issue give me serious pause. It’s such an interesting firearm that does what it’s supposed to do, which I think makes it well worth consideration. I highly recommend that you rent this pistol and try it out for yourself. I bet you’ll be at least partly impressed. Just purchased the ccp and shot it at eagle gun range. I love the look and feel of the gun. It was more accurate then my 9mm shield. Over all it performed well for a new gun. The slide failed to lock back on the last round and I had a few miss feeds. It will probably correct it self after it is broken in. My biggest disappointment was that there was no discernible difference in the muzzle flip of the ccp and the 9mm shield. The take down and reassembly is a real pain compared to the shield or my glock. The trigger is long but not bad . The sights are minimal. I like the gun, but I don’t think there is anything to be gained by the gas piston system. Especially, when you consider the inconvenience of the take down and reassembly. I made the mistake of buying mine before reading this or any other review. The olive green frame and black slide looked good, and 40yrs great service with an old PP .32 combined to trigger the impulse. I too love the accuracy; but the long pull destroys accuracy when shooting fastest as i would in aCQ fight. The frame heating makes much continuous practice problematic as well. But cleaning it is the deal breaker for me … Lose the takedown tool and a troublesome disassembly becomes stupid hard. I’ll keep looking while continuing to pack my 45 Commander. Hi Mike — I have owned a CCP for over a year now and appreciate your comments. However, I must say that a lost take-down tool is easily replaced with a small flat-head screwdriver, which works as well as the plastic take-down tool. After a little practice, take down now takes about 7 seconds. Re-assembly takes slightly longer because of the need to align the piston with the piston hole before the slide will settle onto the receiver properly. Then knock on this pistol for me, then, is that it takes a little practice before take down is easy. I carry using an IWB holster by Alien Gear, and can say with confidence that I have never printed, even with a tucked in shirt. So the size of the gun, though it is not as small as others, is not problematic at all when conceal carried. The trigger pull and reset are long , but when firing quickly have never posed a problem for me, or noticeably affected accuracy. And I cannot say enough good things about the grip. It is one of the best feeling, most comfortable grips I have experienced. I carry my CCP on an almost daily basis, and leave my 1911 Gov’t. at home on my bedside table. My question for the reviewers would be: If we are dealing with a person with small or weak hands, does the ease of racking the slide–reportedly far easier than other semi-autos–outweigh the drawbacks when we are talking about a concealed carry role to be used only for self-defense–and, of course, the required practice with the weapon? Hi Michael. Interesting question, but to which drawbacks are you referring? Andy, great review of the CCP. It is an extremely comfortable gun to handle. I’m looking for a pistol this size or smaller of the same quality. It must have a manual safety, high level of accuracy, and handling comfort like the CCP. Would you mind giving me a recommendation or two? Thank you. Glad you enjoyed my review and I appreciate you saying so. As for a recommendation, I must first ask, will the CCP not work for you? Not sure if anyone is still going to read this, but there’s currently a recall on the CCP. As of January 18, 2018, the web link you provided does not exist. If I “recall” correctly, it had the potential to discharge if dropped. I sent mine in and got it back fixed and I’m sure they addressed that issue in subsequent manufacturings. As for my take, I’ve owned a CCP for nearly 2 years now and love it. My biggest problem was the trigger. I thought it would be a deal breaker. It was a long and coarse pull but after about 200 – 400 rounds at a range and some oiling, it’s now smooth and I don’t notice the distance anymore. It’s really all about getting used to it. But despite how much I initially hated it, I was continuously shocked at how close my groupings were and there was no getting around the comfort of the grip. As far as the take down goes it gets super easy once it’s broken in and stripped a few times. The “button” slides in very easily now and takes anywhere between 2-4 seconds to break down. I’ve even done it a few times with my house key. A little bulkier than other conceal carrys and heavier too but it’s solid, super comfortable, crazy accurate and reliable. I feel confident it’ll do what I need it to do if a self defense situation ever comes up. Overall this pistol is not bad, very comfortable, feels great, comfortable to carry and accurate. Like any other ‘factory’ pistol there is a lot of room for ‘improvements’. The noticeable difference in recoil comes about when you fire hot self defense rounds. With the lighter range ammo they’re really isn’t much difference. I know it sounds silly, but give it a try. Will Walther “update/upgrade” the sight dots from gray to white when I send it back for the recall? Mine is definitely on the low-contrast end of the spectrum. This pistol handles and shoots very nicely (amazingly well actually), despite the creepy, jumpy and long trigger pull. Would really appreciate knowing how John Roberts “polished up” — the trigger. Ran about 50 rounds ( a box of ammo) through several times, and while it did get warm., I never felt like it was so uncomfortable that I needed to stop. I like it even with the strange flaws noted by the author. Just one of those odd things — a warped attraction I suppose. you reviewed two guns I really love. but cited weight of the walther ccp as an issue but not with springfield s xds, they weigh the same…..???? as well as the only review to find the softcoil gas system not anything special in reducing recoil..??? My wife just picked a new CCP on sale last weekend and just got to fire it for the first time tonight. I purchased several boxes of 9mm rounds from GECO, Remington, Fiocchi, Hornady and Federal White Box. I have read several posts about some ammo not ejecting the casing or stovepiping so I wanted to be able to go to another ammo supplier if there was an issue. She was accurate with the pistol as soon as she was firing thru the second magazine in the weapon. All the brands listed above worked flawlessly except the Fiocchi which had several FTE and stovepiping of the recently fired round. The trigger is smooth and the wife says it pulls like her Ladtsmith revolver. She has about 100 round thru the gun and loves it. I purchased this for my daughter specifically due to the ease of the slide. Most women have problems with the spring tension being too much for them to chamber a round without difficulty. I found the recoil very light compared to my other 9’s. The accuracy is as stated, very good. I was not aware of the heat issue but lets be honest, if you use it as intended in a CCW capacity you should never use it enough to see the heat effect. We shot at least 50 rounds after purchasing and the heat was not noticed. Chief complaint is the flipping rail under the barrel. Yes I know it’s for a light or laser but who carries something like that for personal protection, really. The grip is outstanding but mag does seem a bit short. Carried most comfortably in a shoulder harness type system (because of the rail. ) Have a custom OWB for my CCP but really prefer just my Clipdraw. Certainly lighter than my 1911 Micro-Compact! Almost everyone I know who carries does so with a light. Because that’s an important component for personal protection. Certainly not mandatory, but a good component to have. Also, a clipdraw is a ticket to negligence, as it does not cover the trigger guard. I recommend you invest in a proper Kydex holster. I have to finally reply to at least one person who acts like everyone who carries is only worried about muggings etc. Why would I want a laser? Because I’m the pastor of a church. I try to turn the other cheek Matthew 5:38 but I’m not going to throw my parishioners to some swine with a murder-suicide wish, Matthew 7:6, and that’s a 16-30 yard issue. If you’re only ever going to shoot something up close, why decide on buying “the sniper pistol”? If I need a gut gun for a sloppy mugger I’ll carry my silly but amusing Cop 4-barrel derringer from the ugly biker-looking guy in Blade Runner or the bad chick in The Matrix Reloaded. But I’d never consider trying to surgically pinpoint a murderer in my church with it, so I selected a gun which would make use of the marksmanship I’ve developed renting and/or owning impractically large guns. NO one else ever seems to think about being in situations where they’re saving loved ones at 20 yards unless they’re a criminal or fantasize about going merc or militia; maybe that’s why the opportunity to save friends and loved ones at 20 yards goes so often missed (so to speak), people don’t prepare for it. God Bless. Thanks for your well reasoned thoughts, Jeff. Wish more folks thought like you do. Pucrchased our CCP as our 1st handgun about 6 months ago. After about 700 rounds or so and some focused polishing, I will say that the trigger (which is a universal complaint) has fully smoothed out and is fine. While the barrel does tend to heat up, it is not a problem putting 150 rounds through it with no issue. I will say that the ergonomics are incredible. While I have not shot a lot of handguns, I have not held one that was as comfortable. I wanted brighter sites, so I found the paint markers in a couple of colors and in about an hour had a much better focus for targeting. Our groupings with the CCP are great and this has been a wonderful first weapon to learn with. And what we will take our LTC with. Just purchased this pistol, and after shooting 3 rds it started to walk all over the target, low high, left ,right. After a short cooling down I was able to get 3 more rounds on target before starting to wander again. Has anyone else had this problem ? If so how can it be corrected?